Hello everyone! I hope you are all cosy and warm behind the sewing machine or on the couch. As gorgeous as it looks, the weather is quite unpleasant at the moment. I spend most of the time these days on the sofa, I have to admit. As much as I love sewing, nothing beats a hot tea or coffee and a great book when it’s freezing outside. I will try and squeeze in some sewing tomorrow, though. I’m in desperate need of some thick, cosy sweaters! 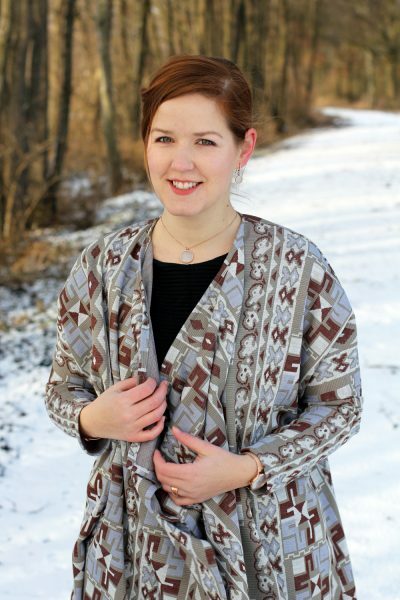 Today I’m sharing another version of the KEIRA Cardigan with you. 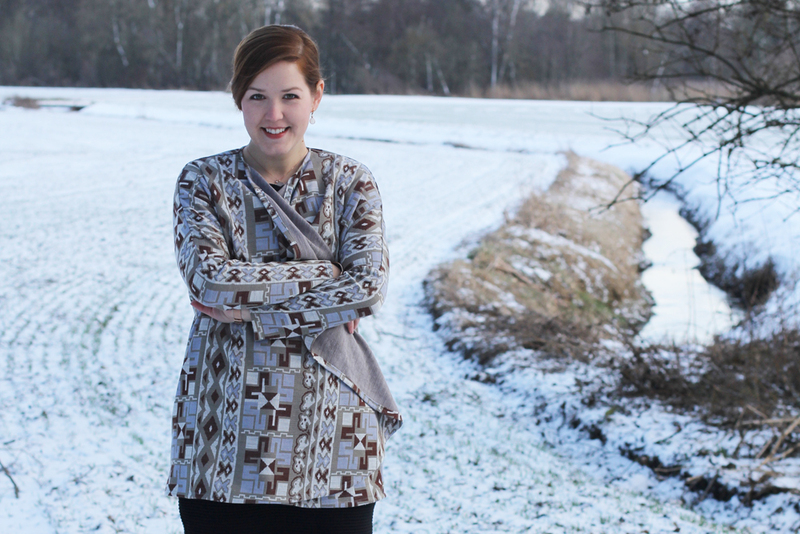 This time I tried hacking the pattern into a waterfall cardigan. They’ve been fashionable for the last few years and are super comfy during the cold season while looking quite chic. 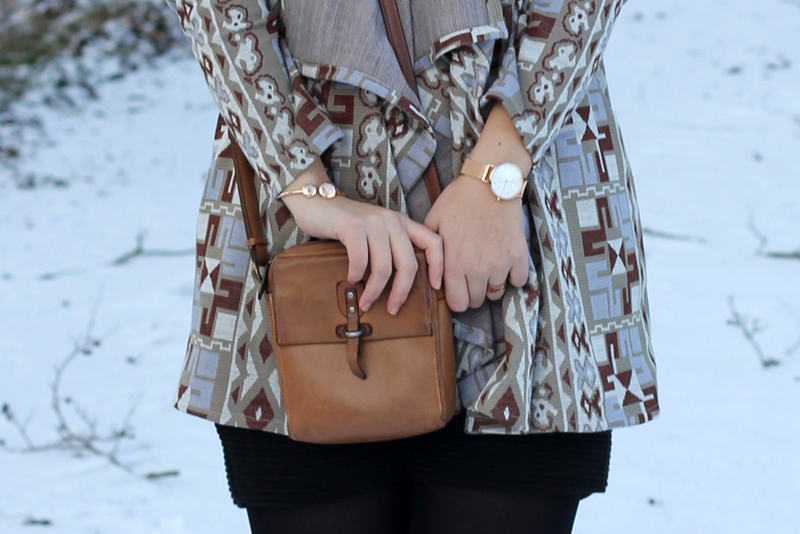 The extra fabric at the front ensures a bit more warmth even when you’re wearing the cardigan open. 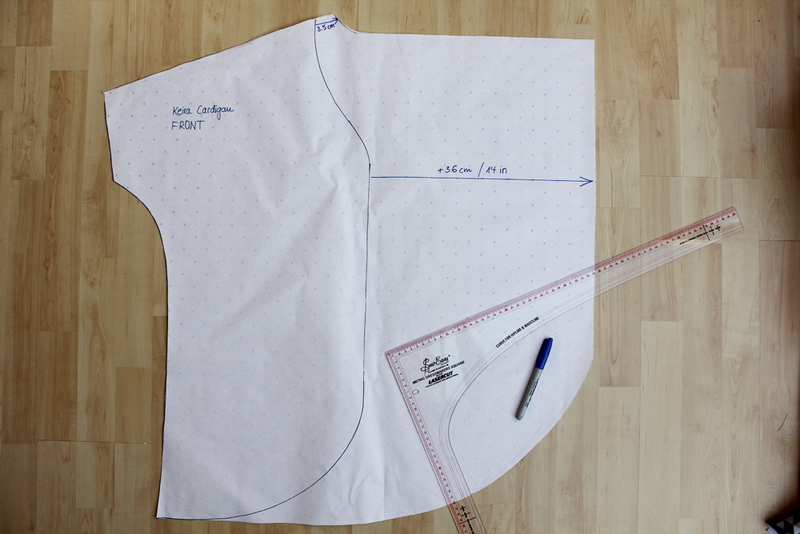 Once you cut out your size, you’ll need the front and back pattern pieces and a large piece of paper. Dot-and-cross paper works really well, but you can also tape together some printer paper. As I wanted to preserve the original pattern that I had already assembled, I traced it first. I’d recommend keeping one set of original pattern pieces to use and trace for multiple hacks, if it’s a pattern you use often. If it’s a one-time project, you might as well glue additional paper onto the pattern and apply all changes directly onto it. Once traced, I lengthened the shoulder seam by 3.5 cm, as I did not want to add any binding. Thus, the neckline would sit a bit higher up and closer to the neck. I then moved the centre front by 36cm (14in). This is the extra fabric that will create the waterfall effect. 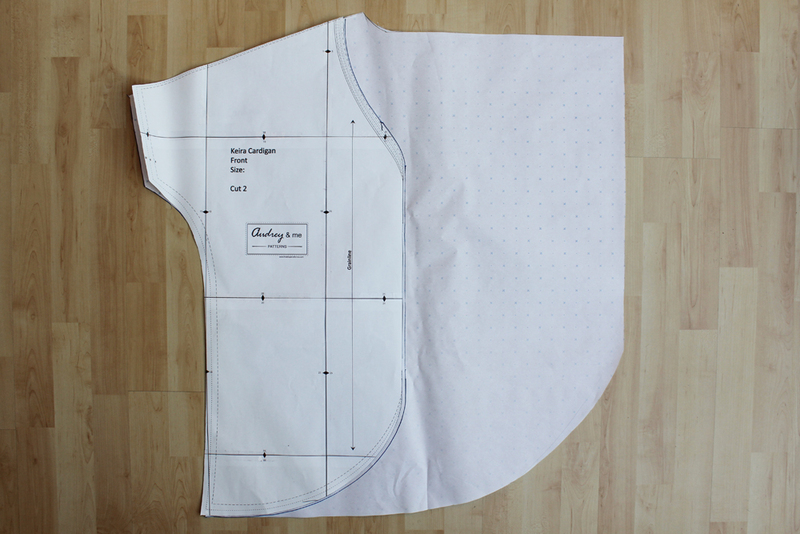 You will need to redraw the curved neckline which now doesn’t plunge down as far (approx. 5cm) and then proceeds as a straight, perpendicular line until it meets the centre front line. There are two style options for the hem. You could either just draw a straight line towards the centre front or, as I did, go for a curved hem and shave off that lower corner on the new front pattern piece. If you leave that corner, the fabric will dip down below the hemline as the fabric drapes into the waterfall. I tried that at first, but it wasn’t for me. There are only minor changes to be made on the back pattern piece. Just add those extra 3.5 cm at the shoulder seam line, so both pattern pieces match up in the end. You’ll also need to redraw the neckline here. And that’s basically it! 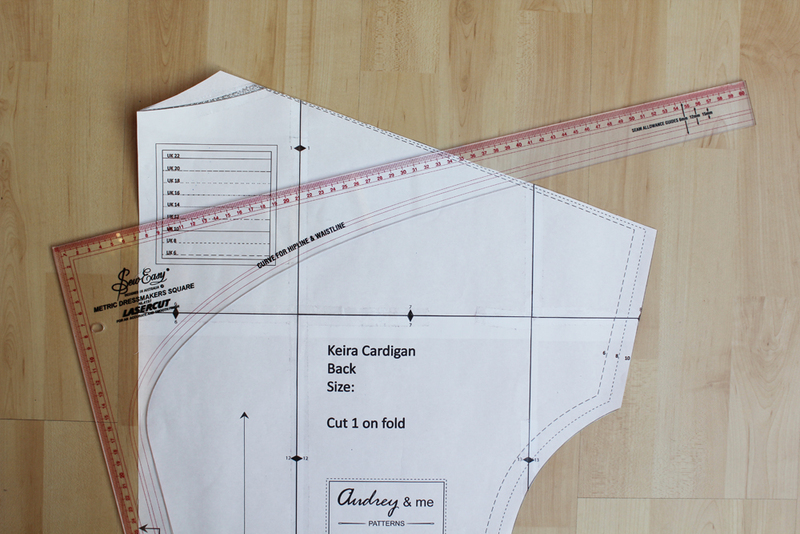 You can now cut out and construct the cardigan as shown in the instructions. Instead of using a binding, I folded the hem over twice by 1 cm, stitching everything in place close to the edge of the fold. This needs a bit of skill where the hem curves. I used a lot of pins to create a smooth, even curve and gave it a thorough press before machine stitching the hem. Hope you liked this easy pattern hack! Feel free to download the pattern and try it yourself. It’s such a quick project – perfect for a lazy Sunday afternoon! I’ll definitely make another one. Next time probably is an even cosier fabric, such as wool or fleece-back jersey. Have a great weekend & keep warm!